ANOTHER MATCHDAY IN Cardiff where the Millennium Stadium roof is doing its level best to upstage the players beneath it. In the Six Nations both teams involved must agree before the roof can be shut over Wales’ home ground. This week, France followed Scotland’s lead in agreeing to the climactic change that a closed roof would bring. Today, however, the WRU have had to abandon the plan and a ‘technical issue’ means Wales and France will play in the open air. BREAKING: Due to technical issues, the roof will remain OPEN for tonight's #WALvFRA clash at @principalitysta - so wrap up warm folks! The teams were informed of the technical glitch earlier today. Email “Technical glitch means Wales can't shut Millennium Stadium roof for tonight's clash with France”. 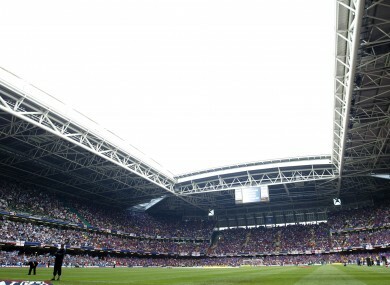 Feedback on “Technical glitch means Wales can't shut Millennium Stadium roof for tonight's clash with France”.